Bleachfield Cottage 2, Bleachfield Cottages in Milltown, Co Kerry sleeps 6 people. Bleachfield Cottage 2 is part of Bleachfield Cottages, part of a small holiday home complex comprised of cottages with thatched, slate and corrugated roofs. These two similar terraced properties are situated in the heart of the pretty little village of Milltown. Both properties (refs W32109 [Bleachfield Cottage 1] and W32110) offer attractive, traditional style, spacious living areas with double height ceilings, feature fire surrounds and wooden beams. They offer a great base for touring the county of Kerry, with Tralee and Killarney just a 15-minute drive away and Dingle 40 minutes away. Discover the glorious scenery of the Ring of Kerry Driving Route and the Dingle Peninsula, or the miles of stunning beaches at Inch (10 miles) and Rossbeigh (7 miles). Fishing, walking, golfing, horse riding and mountain climbing are all available locally. Shop and pub and restaurant 100 yards, seasonal restaurant on-site. 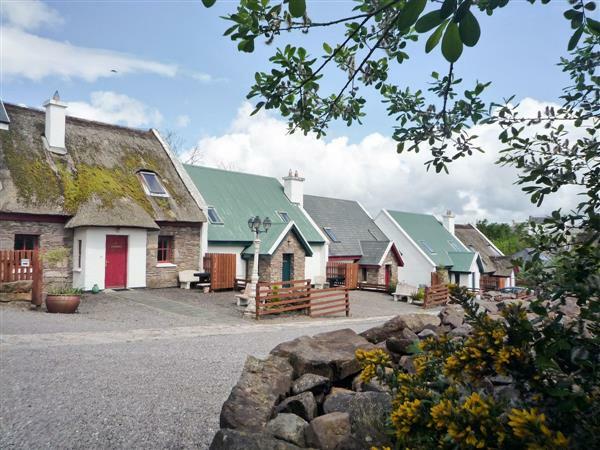 Part of a small holiday home complex comprised of cottages with thatched, slate and corrugated roofs, these two similar terraced properties are situated in the heart of the pretty little village of Milltown. Both properties (refs W32109 [Bleachfield Cottage 1] and W32110) offer attractive, traditional style, spacious living areas with double height ceilings, feature fire surrounds and wooden beams. They offer a great base for touring the county of Kerry, with Tralee and Killarney just a 15-minute drive away and Dingle 40 minutes away. Discover the glorious scenery of the Ring of Kerry Driving Route and the Dingle Peninsula, or the miles of stunning beaches at Inch (10 miles) and Rossbeigh (7 miles), Fishing, walking, golfing, horse riding and mountain climbing are all available locally. Shop and pub and restaurant 100 yards, seasonal restaurant on-site. Ground floor: Living room with wooden floor/dining room with tiled floor. Kitchen with tiled floor. 2 bedrooms: 1 double, 1 twin, both with wooden floor. Bathroom with bath, shower attachment and toilet. First floor: 1 double (5ft 6in) bedroom with wooden floor and en-suite shower room with toilet. Electric fire in living room by meter reading. Electricity by meter reading. Bed linen and towels included at Bleachfield Cottage 2. Travel cot. High chair. Satellite TV. Electric cooker. Washer/dryer. Dishwasher. Wi-Fi in on-site restaurant. Sitting-out area with furniture. Parking (2 cars). Cycle store. Electric fire in living room by meter reading. Electricity by meter reading. Bed linen and towels included. Travel cot. High chair. Satellite TV. Electric cooker. Washer/dryer. Dishwasher. Wi-Fi in on-site restaurant at Bleachfield Cottages. Sitting-out area with furniture. Parking (2 cars). Cycle store. Holidays at Bleachfield Cottage 2, Bleachfield Cottages run from Saturday to Saturday. For a better idea of where Bleachfield Cottages - Bleachfield Cottage 2 is, you can see Bleachfield Cottages - Bleachfield Cottage 2 on the map below. Do you want to holiday near Bleachfield Cottages - Bleachfield Cottage 2 (W32110), you can see other cottages within 25 miles of Bleachfield Cottages - Bleachfield Cottage 2; have a look to find your perfect holiday location.